I have been travelling enough in the last few years to have realised that currency exchanges are not that easy or user-friendly. You either need to get the currency you need before you arrive in the country – but how do you know how much you will need – or you end up having left-over currency that’s not enough to exchange back. Another option is to try to exchange it once you arrive at the location, but it might be late at night and the exchange bureaus closed. Or you might be forced to exchanged as soon as you arrive (to get money for a bus / taxi if you’re in a rush) and get a unfavourable rate. I have sometimes travelled in the span of a week between 3 countries with different currencies and that makes things even worse. At the end of the day you don’t even know how much you’ve spent (if you don’t know the exchange rates by heart or are simply not that great at maths, or are just tired). Through recommendations I have found a solution to all of that hassle and trouble – Revolut (note, I am in no way related to the company or getting any benefits from sharing about them, I am simply a very happy customer). Open your app and see exactly how much money (in the currency you know) you have spent, where, at what time and for what. 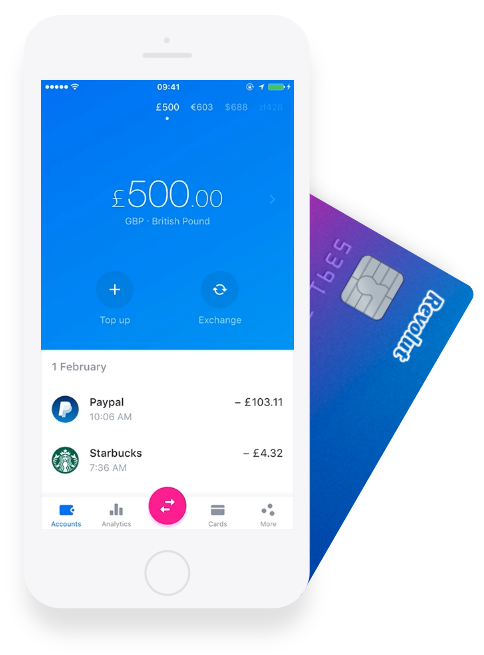 A screenshot from Revolut’s app on their website to illustrate the transactions history and account summary. Some other great features they proved is the ability to see your PIN code for the current card you have, if you have forgotten it directly from the app. The ability to just block your card – if you have lost it or it got stolen, you can open the app and block it immediately, no one will be able to use it and you can just order a new card and use that instead. This is absolutely amazing for anyone travelling abroad as things just happen. Has any of you used other methods of currency exchange or other tips for how to save on those exchange rates and any other tips you might have?